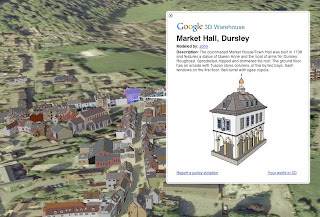 John is a retired British architect whose passion for photography and knowledge of his town's architectural history helped shape his beautiful 3D models of Dursley, Gloucestershire in England. "The alignment of the buildings on Castle Street is a bit on the skew," he said, "but that makes sense if you know there used to be an actual castle in that location. The castle had a moat that the streets were laid out around." 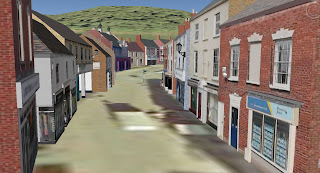 John started using Google Earth and Google SketchUp around the same time. His brother was introduced to SketchUp at a lecture on SketchUp by his SeniorNet group. 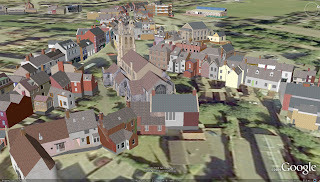 John's local library had an Internet cafe and, on his brother's recommendation, he took a look at Google Earth. "I was absolutely staggered. And decided I had to put Dursley on the map. There's another chap who does great stuff in Gloucester City called Andrew. He helped me out when I was first getting used to the process, in dealing with stuff like zed-flashing (z-fighting), where two overlapped textures have a flashing problem." As John explains, an architectural background and access to information on the history of a specific site are both critical to his process for creating a realistic representation of Dursley. "What's remarkable to me about 3D buildings in Google Earth is that they can combine in a live model all of the detail that is otherwise only available from different books and records. There is a resource in the UK called Buildings of England that describes with great precision the development of different local architectures. That helps me, but so does my knowledge of standard architectural practices that haven't changed all that much through the recent centuries." John also draws a good deal of understanding about a structure based on the form of its roof as seen in the Google Earth satellite imagery. He is also keen on architectural photography (check out John's photo site). "Knowing how roofs are built helps you: most roof surfaces have a similar slope and extend beyond the building footprint, but more important, the roof surfaces tell the story of how the walls are arranged. Add to that the fact that string courses have been used right through the centuries, work with some solid photos, and, Bob's your Uncle, you can be successful." As for inferring building heights, John relies on his photos and makes "jolly well sure" the doors are 2.1 meters high on the textured model. "You really need to understand how components and move/array can help you in SketchUp. Architecture has always had repeating elements. Once you have created one Victorian chimney, for example, it's likely you can use it for multiple sites. Really the key for repeatable success is to get the hang of working with SketchUp's grid system, setting your point of origin, aligning Red and Green axes to your site, and then drawing on axis. Getting on axis is like turning on the ignition before trying to drive your car." "I really see a great educational benefit in having architecture available in Google Earth. The models are an encapsulation of so much history, architectural geometry and knowledge. They are especially important for the area of my focus, 'Listed Buildings', what you call Historical Register in the States. There really is no other way to truly capture all the detail of a building so clearly and concisely. " 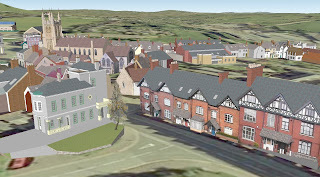 Check out John's site on Dursley. As a result of his impressive work, John's models have been highlighted in the press. "The BBC was out to see what I was up to for a profile and so were the local papers." So why does he do it? According to John, he and his fellow modelers model their cities in 3D so that the world can experience the places they hold so dear. "What motivates both Andrew and myself is the same kind of interest in our home town or city. Combine that with architecture, history, and a means of sharing it with the world you can see why I get so excited. My brother thinks I should publish a coffee table book called, 'Dursley from All Angles' using screenshots of my models; I just might."